Ravenbanner captured from Danes in 878 a magical talisman (woven by Ubbe’s 3 sisters, the daughters of legendary king Ragnar Lothbrok) that was believed to foretell victory if the raven’s wings caught the wind before a battle. 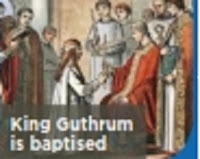 King Alfred united his people for a last desperate fight and in the bloody battle at Etandum (Between the towns Asdown and Chippenham), Alfred the great won the battle and he then entered Chippenham where he forced viking chief Guthrum to be baptized and become a Christian. 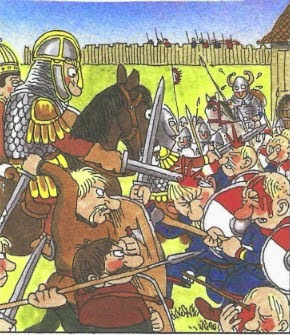 Viking soldiers of fortune was hired by Hywel ab Ieuaf ab Idwal the Bald , they destroyed the Church of Clynnog Fawr and attacked the Lleyn territory in Gwynedd. The Welsh usurpator Hywel had hired the vikings to assist in his desire for the throne of Gwynedd.